Davlin is the premiere source for lasting quality and durability in retractable awnings, boat and dock coverings, aluminum and insulated decking and custom fabric design. Shades, Sunrooms, Patio Covers. Also framless glass and picket railings. Cantilevered boat awnings, retractable, dock slip covers, car and boat shelters. The most advanced log recovery business in Ontario. Up to five hundred year old premium hard woods including oak, maple, bird's eye maple, beech, birch and premium softwoods including red pine, hemlock and white pine. Coulson Brothers Barging Service |Milford Bay, ON Family owned and operated business that has been serving the lakes of Muskoka since 1969. Quality construction materials. Large construction projects or small home improvement efforts. Construction & Forestry Equipment Dealer, Your local Doosan, Case Construction and Husqvarna Dealership. Restore all of your carpet and upholstery to their maximum clean potential. We provide Designs, Finish Samples, Cost Estimates, Building Permits & Management to suit your schedule & lifestyle in Muskoka! Home & Cottage Additions. 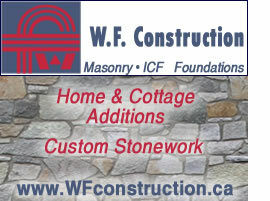 Custom stonework, masonry, ICF foundations, concrete floors. -Serving Emsdale, Huntsville, Kearney and surrounding areas. Your one-stop shop for all your home renovation needs. Custom Manufactured Homes, Custom Material Packages and Log Home Packages. We can custom build your dream home or cottage. Provides a full range of electrical services including Overhead & Underground Power Line Installation Services, Hydro Pole Services, Panel Upgrade Services. Bowman Fuels Ltd is a family owned and operated business with over 30 years of experience in the fuel & lubricants industry. Residential home heating oil, propane, heating and cooling services in Ontario, and commercial fuel in Simcoe County and the Muskoka Region. Offices in Barrie, Bracebridge, Orillia, Midland, Timmins. Personalized contracting customized to your needs. From inception to completion Handyman Services will satisfy all your renovation and contracting needs. Cottage, outdoor and general handyman services. Area of service includes all of Haliburton County and northern City of Kawartha Lakes. Full cottage services, tree removal, pruning and landscape; grounds and garden maintenance, interior white glove service, cottage spring opening and shut down. Maintaining and managing your home or cottage. Managing rental units. Full service property management.Serves Thornbury, The Blue Mountains, Collingwood, Owen Sound, The Georgian Triangle, and The Georgian Bay Area. Providing you with four seasons of reliable and prompt service in managing your business, home and cottage property with interior and exterior services! 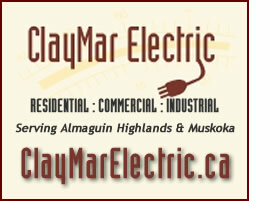 We offer heating, cooling and indoor air quality solutions to the Muskoka Ontario region featuring Bryant products. supplies and services a complete line of heating and cooling products. Full-service residential and commercial design firm featuring a 13,000 sq. ft. building on Fairy Lake encompassing a retail showroom, design offices and a full-service textile workroom. We offer full design services including in home design consultation, kitchen and bathroom design, fabrics, wallcoverings, custom area rugs, upholstery, draperies, custom cushions, bed linens and hard window coverings. Interior design, colour consultation, organization, staging, decorating. A full service design firm with locations in Port Carling and Collingwood. Muskoka Paint and Decorating is proud to be an independent Benjamin Moore paint retailer serving the Bracebridge community. We specialize in interior and exterior painting.We do both repaints and new construction in all areas of Muskoka. Residential, commercial, industrial. Muskoka and Georgian Bay area. Exterior and interior wood restoration. Full service contracting company - From repair jobs and service calls to new buildings and the largest renovations jobs. Roofing, Siding, Soffit, Fascia and a certified installer of the Enviroshake roofing system. Residential & Commercial pest control - We have our own boats to service to Island properties. We service all of Parry Sound, Muskoka, Georgian Bay, Barrie, Owen Sound, Lake Simcoe, Lake of Bays and the Kawarthas. From industrial/commercial to residential problems we can handle any wildlife or pest complaint. Serving areas surrounding Barrie, Orillia, Muskoka, Midland. My capable staff and I are the best when it comes to locating and eliminating carpenter ant problems for cottage owners and homeowners on Lake Muskoka, Lake Rosseau and Lake Joseph. Carpenter ants, mice, bed bugs. Specializes in residential, commercial, industrial roofing in every size property. We pride ourselves on offering the highest quality exterior products for your home, including vinyl siding, specialty roofing, windows and doors, decking, rain water management products and much more. We specialize in roof repairs, renovations, windows, siding and doors and offer emergency services 24/7. Belanger Aluminum specializes in sales, service and installation of windows, doors, roofs, siding, eavestroughs, Gutter Helmets and aluminum fascias and soffits in the Midland, Ontario area. Designs and installs septic systems of all sizes. We are an authorized installer of The Waterloo Biofilter Systems for small and difficult sites. With all systems we will prepare a quote outlining fixed costs and possible options to consider. Most systems can be installed in less than 3 days with or without you using the dwelling. We offer waste disposal bins, septic pumping, and portable toilets for Muskoka and surrounding area.